Remember this Vanity Fair article: Of the 1%, by the 1% for the 1%? 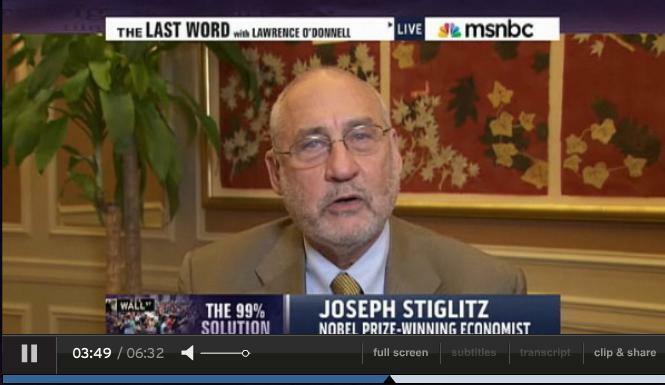 Professor Joseph Stiglitz was at the “Occupy Wall Street” rally and appeared on Lawrence O’Donnel’s show. (I don’t agree with everything he said). Watch the interview. more than the republican party’s intransigence, it is the lack of coherence in democratic party that is killing this country. we all know the stupid stubbornness of GOP, but that the known enemy. But what about the guys who have a majority in the Senate! Do they have any plan? I suspect there are many closet ‘right wingers’ in there. We have a saying in telugu ‘ Inti dongani Easwarudu kuda pattaledu ani’. Seems that is what is going on. I think it is failure of democratic leaders that got the house majority for GOP and now nothing happens in this country! ***t (sorry for the expletive). No wonder the youth in this country however liberal they are, are disillusioned by this party. look at this news today. why are they not supporting the sane proposal of white house and come with something as stupid as this, knowing this will not pass at all!